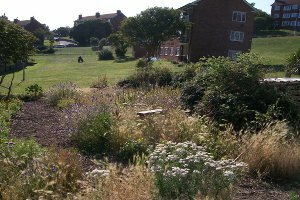 Access to Nature in Sussex, is a project which gives people from deprived urban areas the opportunity to experience the natural world and conserve wildlife on green spaces close to their homes. It is a three year project from January 2010 helping local people in Brighton & Hove and Hastings to develop new confidence and skills while they make improvements to their local green spaces. The three main partners in the project are Sussex Wildlife Trust, Brighton & Hove City Council and Hastings Borough Council. This project has been made possible by Access to Nature - a £25 million grant programme administered by Natural England as part of the Big Lottery Fund’s Changing Spaces programme. The Access to Nature project has been busy gardening for wildlife with local residents across the city. Small parts of the green spaces around areas such as Craven Vale, the Bates estate and the Bristol estate have been designed to bring nature to people’s door steps. We have been sowing wild meadow seed and planting the types of flowers and herbs that can be found on the Downs surrounding us. Plants such as knapweed and marjoram are great for attracting bees and butterflies into the heart of the city. Areas of grass have been allowed to grow longer providing homes for insects such as grasshoppers and old logs can provide hiding places for frogs, toads and slow worms.